Researchers have discovered what they consider to be a complex system of canals and waterworks that was ahead of its time during excavations at the 2,800-year-old ancient city of Aigai in the province of Manisa in western Turkey. Situated on a rocky hill about 49 kilometers outside of Manisa, the city features an advanced waterworks system designed to protect against floods and conserve rainwater. 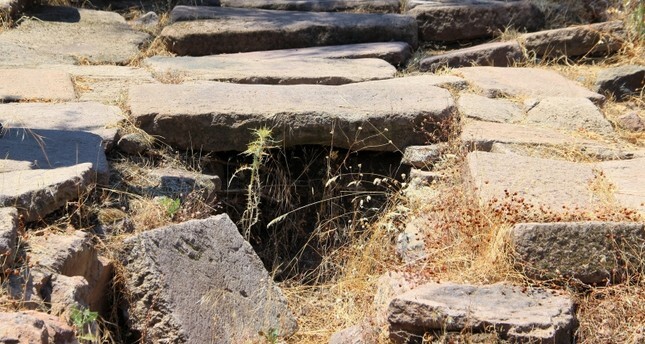 Associate Professor Yusuf Sezgin, faculty member at Celal Bayar University's Archaeology Department and the head of the excavation team, explained that the city's elevation was one of the main reasons for the system's necessity. "It is impossible to bring water into the city as the city is situated on the highest point in the area. The need for a water source was fulfilled by collecting rainfall," Sezgin said. According to Sezgin, inhabitants of the city collected rainwater by routing the water with gutters on the roof into clay pipes, which ran through the walls. The pipes even had free space next to them inside the walls, to make it easier to replace parts of the pipe that got clogged. The collected water was then stored in 5 meter (16 ft.) deep and 2.5 meter (8 ft.) wide cisterns. The city had different cisterns designated for families, the public and industrial use. The waterworks also protected the city from floods by routing any excess water outside the city, Sezgin said. "People in Aigai were great city planners. The buildings were protected from water with channels running through and under them. We think it is an excellent work of engineering. There are almost 100 cisterns located in the city, we did not expect this many," Sezgin said. Researchers previously discovered that rainwater wasn't the only thing collected by the residents. Urine was also stored in jugs after being routed from bathrooms through a drainage system to be used in leatherworking. "Urine was used in leatherworking in ancient times," said Sezgin, explaining that the city had various workshops, including leatherworking, weaving and painting. "Urine was precious, it shouldn't have gone to waste. The Roman Empire even had a urine tax," he said. Talking about this year's excavations, Sezgin said they were also focusing on what they hope to be a temple of Athena. "We have a temple in here, probably a temple of Athena. According to the written sources we have, there should also be an altar of Zeus near it," he said. Excavations at the ancient city began in 2004 and several valuable discoveries have been made, including a temple of goddess Demeter, a stadium, a theater and a three-story agora. One of the 12 ancient cities established in western Anatolia, Aigai became a regional point of economic and cultural attraction during the Hellenistic period in the 3rd century B.C. with the support of the Kingdom of Pergamon.